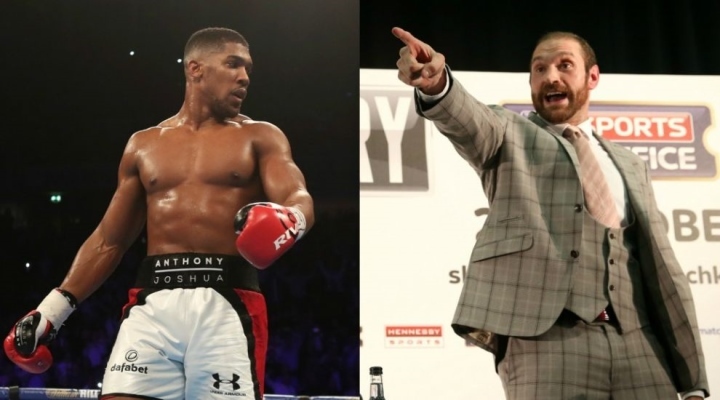 Anthony Joshua's promoter Eddie Hearn would love to see his fighter take on controversial former world heavyweight champion Tyson Fury next year. Joshua successfully defended his IBF, IBO and WBA heavyweight titles against Carlos Takam in Cardiff on Saturday and either WBO champion Joseph Parker and WBC champion Deontay Wilder appear the most likely next opponents. "I think the Wilder fight is potentially one of the biggest in world boxing and I think that fight is realistically going to happen in the summer of 2018," he told BBC Radio 5 Live's Sportsweek. "But Tyson Fury is a guy who we'd love to see come into the sport. Whether that'll happen or not is another issue. "The problem for him is to overcome the governing body and UK Anti-Doping. "I think he will come back. I think at some point he will wake up one morning and think, 'I've got to get myself together here' and go challenge in these big fights. "If he does, with one or two fights, then I'd love to see the Anthony Joshua fight and I'd like to see it in 2018." Fury has been seen at numerous events in the last few months and still appears to be far from his normal fighting shape - or at least the conditioning that saw him score a major upset in November 2015, when he traveled to Germany to shock Wladimir Klitschko with a twelve round unanimous decision for the unified heavyweight crown. Joshua got the biggest win of his career over Klitschko in April, when he knocked he stopped the former division ruler in the eleventh round before a crowd of 90,000 at Wembley. [QUOTE=hugh grant;18172913]By the time fury gets in shape [B]josh will be prime. [/B][/QUOTE] He's prime now....and moves like an old man. By the time fury gets in shape josh will be prime. We want AJ vs Wilder. What is so difficult to understand. Also [B]if[/B] Fury got back to his best and AJ fights the way he did against Takam, AJ loses.